A drawing of Neptune, naked, seen from above the knees, holding a trident in his right hand. Around him are four sea-horses and tails of fishes. Above this is a note in Leonardo's handwriting: abassa ichavalli. Antonio Segni had been appointed Master of the Papal Mint in 1497, though he did not reside permanently at the Vatican and travelled intermittently between Rome and his native Florence. He must have been an erudite collector, for Botticelli presented him with his Calumny of Apelles (Uffizi), and a friendship between Segni and Leonardo mentioned by Vasari would explain why the artist made such an exceptional drawing. Segni’s Neptune is lost, and - strangely for a work that was famed during the sixteenth century - we have no certain record of it in a copy drawing or a print. A large drawing in the Accademia Carrara, Bergamo has been claimed as at least a partial copy of Leonardo’s design, and the upper part of Neptune and the horses to the right there are very similar to those here. 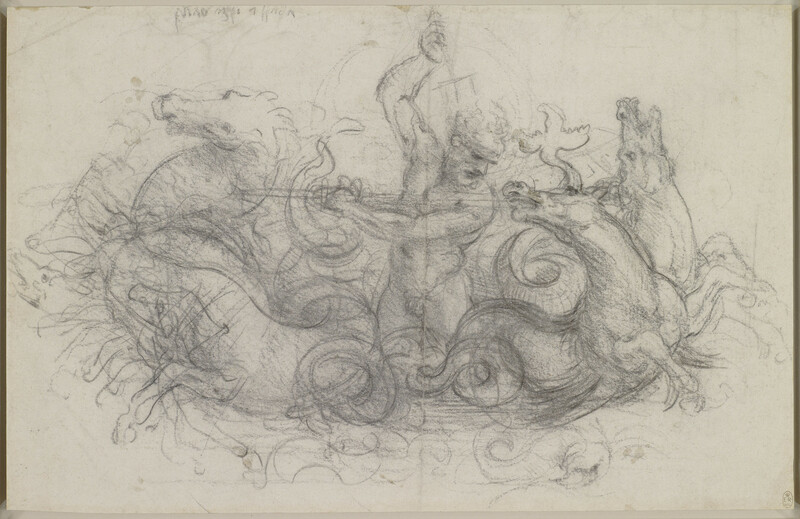 But while the rough head of a dragon-like monster, of a type often drawn by Leonardo, is visible here at the centre left edge of the sheet, the Bergamo drawing does not include any of the sea creatures (other than Neptune’s horses) mentioned by Vasari. This drawing, in which Neptune is seen from the thighs up, carries Leonardo’s rough note to himself to ‘lower the horses’. As has often been noted, an inspiration for Leonardo’s composition may have been a relief on a sarcophagus, then outside the church of Santa Maria in Aracoeli, Rome (and now in the Vatican), that shows Neptune standing thigh-length in a low boat drawn by four sea-horses breasting the waves and placed symmetrically at either side. The drawing must date from around 1504, when Leonardo was working on (among other projects) the composition of the Battle of Anghiari, which involves a comparable interweaving of man and horse; it is likely that Leonardo had visited Rome around the time, for in April 1505 he was reimbursed for customs duty on a parcel of his clothes sent from Rome.